A landing page is designed for a single purpose. 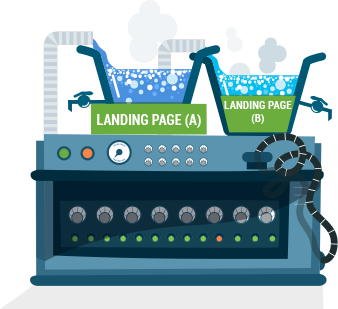 Landing pages often focus on a single product, service, or objective such as getting leads. Landing pages are often associated with specific marketing campaigns, in which media and traffic driving efforts direct people to a common page, focused around that campaign. This helps ensure you are creating a personalized user experience. It is quite common for someone to create landing pages for their Paid Search campaigns, like Google Ads. It’s important to ensure that the content and topic of the ad effectively correlates with the content on the page. Create a landing page dedicated to it! Landing Pages help keep user experience focused on the objective you want them to accomplish, rather than drive them to other pages on your site that may distract them. Don’t worry, we make these responsive, too! You can drive people to landing pages on their mobile phone through useful tools like QR Codes, printed on your brochure or business card. When potential clients or customers click on an optimized search result or an online advertisement, you want to ensure you’re giving them the content they’re looking for! Landing pages are places for you to tailor content towards that curious audience so you can keep them engaged. How do I know if I need a landing page? There are many different reasons you might need a new landing page! If you’re finding that your current home page doesn’t convert, or you’re running a PPC campaign that you need to be able to direct to a specific page, you’ll likely need to have a new landing page created. How long does it take to build a landing page? The length of time it takes to create a landing page depends on a number of factors. From design to content to customized options, each landing page varies in complexity. A well-designed landing page with a compelling message typically takes less than one month from conception to execution. If you have different products you’re advertising, you’ll want a separate landing page to speak to each of them. It’s also an extremely helpful way to increase your quality score, which can lead to less money having to be spent on Google Ads!